A healthy parent-child relationship is the greatest protective factor to support better outcomes for children and young people. 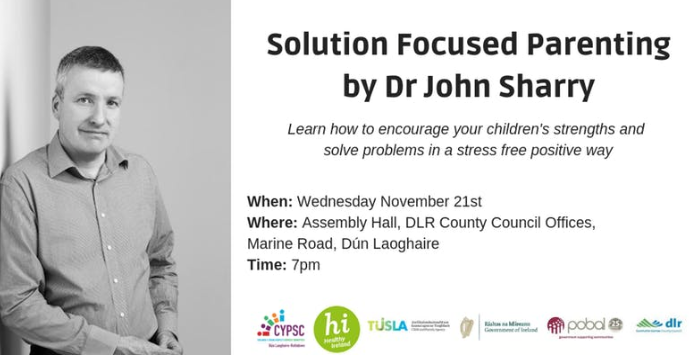 We are delighted to share information on a public talk by Dr John Sharry on ‘Solution Focus Parenting: Learning how to encourage your children’s strengths and to solve problems in a stress free way!’ This ‘Healthy Ireland’ funded event will take place at 7pm on Wednesday November 21st in the DLR County Council Assembly Hall on Marine Road in Dun Laoghaire. This entry was posted in News, news/latest-news. Bookmark the permalink.